Let's talk turkey. Specifically, how good it is in this hearty sandwich—piled high in a round bread loaf shell with cheese and golden-brown onion rings. Preheat oven to 400°F. Cut a 1/2-inch-thick slice from top of bread loaf; remove center of loaf, leaving 1-inch-thick shell. Reserve removed bread for another use. Spread inside of bread shell and cut-side of top of loaf with dressing and mustard. 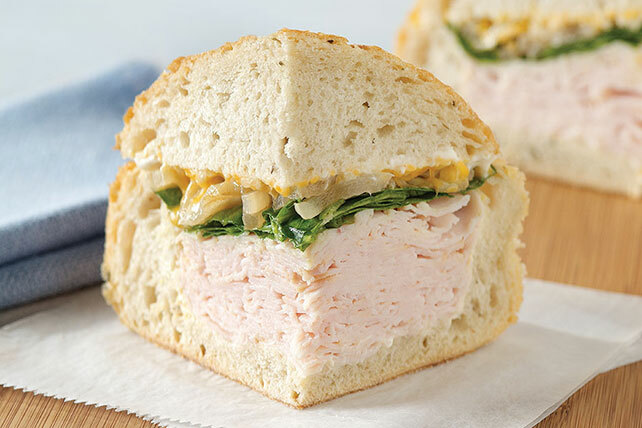 Fill bread shell with layers of turkey, spinach, onions and cheese; cover with top of bread loaf. Wrap in aluminum foil. Bake 30 min. or until cheese is melted and sandwich is heated through. Let stand 10 min. Cut into 4 wedges with serrated knife. Serve warm. Don't worry if the sandwich is stuffed high with filling ingredients - it will reduce when baked.